You’re planning to tie the knot, and you want the whole world to know. But with so many people announcing engagement moments, how do make yours as special and unique as your love as a couple? Here are just a few fun engagement announcement ideas to help spark your creativity. When engagement announcements on Facebook are all the rage, an actual printed postcard stands out more than ever. It’s easy to design your own using websites like Canva, which has templates that let you add your own engagement announcement wording and photos. You can then print your postcards at home, have them professionally printed, and even post your designs online. Of course, you may want to keep the news under your hat for a few days. The postage time will allow you and your fiancé to enjoy keeping the secret until your friends and family receive your engagement announcement cards and flip out! In the age of Instagram, more and more couples are choosing to announce their engagement with a clever picture. Some include cute sayings to announce the engagement – some are elaborate stagings with costumes, props… the works. It’s all about you and your style. This is just a sampling of what’s out there. Find a theme that represents you as a couple and go to town! If this sounds like fun, hire a professional or ask a friend who takes amazing pictures (and can keep a secret) and have a photo shoot. Pick your favorite spot, wear your favorite outfits, and capture the moment! Looking at all of those fun engagement announcement cards and posts, you’ll notice one thing that appears again and again – custom printed merch. It’s everywhere, and it shows no signs of getting old. Choose the one that speaks to you, or go another way altogether. If you really like them, you can order a bunch for your wedding party or pass them out as favors. Gifts: done! If photos don’t quite do it for you and you want to go a step further, try a video. It’s a great creative project for you as a couple, and you can relive the memories any time you want. If this part hasn’t happened yet, think about adding a camera to your big moment. As long as everyone involved is okay with it, this can be a sweet way to let your friends and family feel like they were there when he (or she) popped the question. Planning and shooting a short engagement “movie” gives you and your financé some quality bonding time. It can be a spoof of a favorite film or an original story altogether – whatever you feel most expresses your bond as a couple. This is another one that might require you to find a discrete friend or two to help out, but it’s also definitely possible to do it as a two-person operation. If interactive is more your style, you can plan an engagement reveal party. The trick with this one is not to tell your friends what the party’s about before they get there. Just ask them if they want to meet you for drinks after work or at your place for a casual dinner party. Then, once everyone is gathered, share the big news! If you’re announcing your engagement at a party, why not jump on board with the latest trend in pre-marital festivities – engagement ring cookies! These adorable hand-shaped treats are the latest and sweetest way to let your friends share in your happiness. Frost them any way you like – with nail polish, with a perfect replica of your engagement ring, or tied with a ribbon that bears your name, they make delicious treats and great photo opportunities. A lot of bakeries are getting on board with this sweet trend, but you can also make your own. Don’t worry if you’re not a great baker or cookie decorator – Pinterest fails also work great as funny engagement announcements! If you want the fun to keep going past the party or the initial photo reveal, you can always start your very own engagement blog. You can use a general website builder, like Wix or Squarespace, or try a wedding-specific platform. 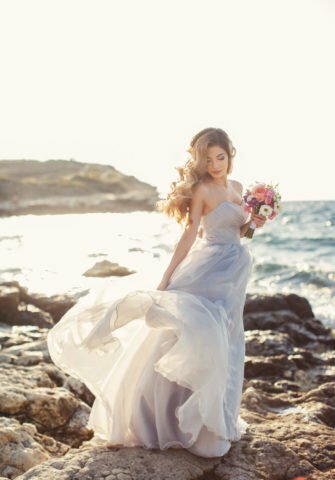 Either way, these unique sites will let you not only announce the big day, but also accept RSVP’s, message guests, and manage your registry. You probably have your own social media accounts outside of your wedding website, so why not connect them all with a unique hashtag? Classics like #tyingtheknot and #gettingmarried always work great, but something like #katenjon4eva or #jennymarriesmark is just that much more special. Have you come up with any of your own ideas of how to announce your engagement? Leave a comment and spread the word. Maybe yours will be the next one to go viral! Also, don’t forget to follow us on Instagram and Facebook for daily wedding inspiration!